To coat non-metallic materials the appropriate technology is liquid paint. 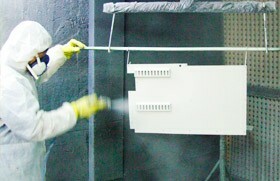 Liquid paint technology offers effective viable solutions on temperature limitations, protective applications on assembled parts or parts where powder coating is not feasible. The application of this technology in fields such as the automotive industry, plastic components and special range of color applications is absolutely indispensable. Our industry has a paint installation in liquid with degreasing by means of steam, pressurized cabins, primer and drying in static furnace.